The trust we need doesnt solely rest with those who are employed by the industry. It should also rest with those who use it. The trust we need doesn’t solely rest with those who are employed by the industry. It should also rest with those who use it. The financial services industry, particularly insurance, is the least-trusted industry globally, according to the Edelman Trust Barometer 2013. This is not inconsistent with Maddock Douglas’s 2012 study that indicates that more than half of the U.S. population lacks trust for insurance companies and insurance agents. While these statistics make the insurance industry cringe, they generally do not come as a surprise. We can blame a lot of different things for the lack of trust, such as complexity of products, intangibility, heavy regulation and maybe even the commission model. Just for kicks, why not throw the HealthCare.gov site into the mix? After all, everyone loves a common enemy. Well, I don’t think fixing any of these things (including the website) will improve trust in the insurance industry. Why? 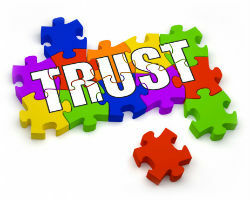 Because the trust we need doesn’t solely rest with those who are employed by the industry. It should also rest with those who use it. This dynamic is rather unique from a product category point of view, perhaps downright weird to many (as I wrote about in last month’s column). What drives the weirdness is the nature of pooling risks and having to monitor who can get in and who cannot get in to an insurance pool. This is why we ask questions about family history, driving record and pre-existing conditions (or at least we used to). Most, if not all, insurance companies started out around a very specific “who,” or, better said, a group of people with a common bond and also a common need to share certain risks. The common needs may have been for insuring their homes, equipment, health or even their lives. And the common bond may have been their religion, the type of work they do, their geography or possibly a military or other type of affiliation or affinity. To those who were among the first in the pool, insurance didn’t seem weird. It just seemed logical. It was a better option than self-insuring against those risks. And trust? A lot of it was between members of the pool, recognizing that their commonality meant that they shared values, beliefs and a sense that they could be stronger as a result of weaving a safety net as a group. Their commonality helped them determine who was in and who was not. Sure, they needed to trust those people who were running the insurance pool, but often those people were passionately driven by the purpose as well, and the structures were set up to make sure the checks and balances were all in place (just like they are today). The bigger issue was the way the others in the pool would behave. Would they try to take more than their fair share? Would they stretch the truth? Those are the things that impact prices, claims experience, dividends and, ultimately, the performance of the group. As the industry ages, we see many insurance companies celebrating milestone anniversaries: 75 years, 100 years, 125 years, 150 years. Is it possible that with each passing decade, with the desire for continued growth, insurance companies get further and further away from their “who?” Or more importantly, that some of the bonds between the “who” are not as strong as they once were? This isn’t a criticism of religious or occupational groups, but an observation that may lead us to a better understanding around where trust comes from. It may be time to recognize that if the insurance industry wants to improve trust, we may need to innovate around transparency among the pools vs. just between the insurance industry and the customer. We may need to enable communication vs. control outcomes. We may need to socialize people into pools vs. sell product. We may need to allow the public to act as a jury at application or claim time, rather than an insurance company to act as a judge. Hmmm. Is the industry and the world ready for a shift toward “who?” I hope so. Time has moved the focal point from the participants in the pool to those who work to support it. I believe we just need to move it back.